You can never have too many chocolate chip cookie recipes, right? But wait, not only are these delicious and healthy, they are made in ONE bowl, with ONE flour, free of grains, gluten, nuts, dairy, and eggs…and they’re pretty stellar on the sugar front as well. I grew up in a family that wasn’t all rainbows and sunshine. Nothing was fundamentally wrong with anyone in the sense of abuse or the like, my parents just didn’t get along well, and though I tried to make the best of my childhood (which I have great memories of overall), I always knew something was amiss between my folks. When my dad would take half days from work, it was me he wanted to spend time with. We’d go out to lunch, to movies, and even shopping together. He was my best friend, which is quite unlike most girls who naturally gravitate towards their mothers. I loved my mom and spending time with her as well, but I definitely favored my dad. My dad and I had much more in common, in that we enjoyed the same TV shows, we’re both introverts, and we have a very similar sense of humor, which is one of the reasons I love my husband so much. Having a sense of humor is extremely important to me, and I couldn’t have married someone who didn’t make me laugh. In addition to laughter, my husband and I both put a strong emphasis on healthy eating, another trait I couldn’t have lived without in a mate. While my emphasis is usually on vegetables, his revolves around his protein intake. Though he loves and eats all of my treats, I know there’s a special place in his mouth for the ones that are higher in muscle-building aminos (like these cupcakes or these brownies), so this got me thinking about chickpea flour. I do so love chickpea flour! High in protein, no eggs needed for binding…how have I not considered using this amazing ingredient in spherical treats before?? Turns out, the stuff makes one hell of a cookie. 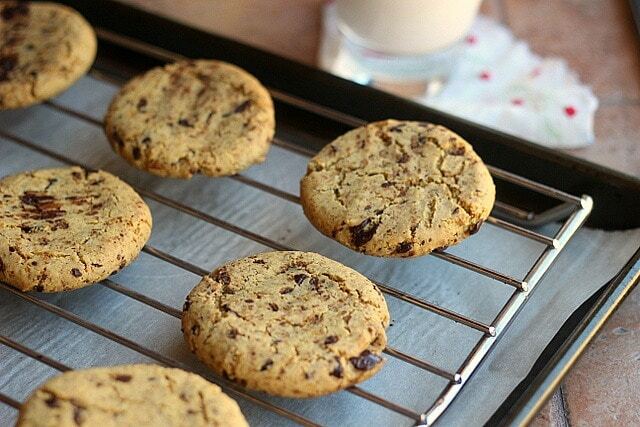 Amazingly delicious chickpea flour chocolate chip cookies! 3/4 c. + 1 T. COLD chickpea flour mine is kept in the freezer **This is very important, as the cookies will spread/flatten otherwise. Mix the dry ingredients together (flour, salt, baking soda, sugar, stevia). Stir in the oil, maple syrup, vanilla, and chocolate until well combined. Add in just enough to moisten all of the dry ingredients (the dough should be very thick). 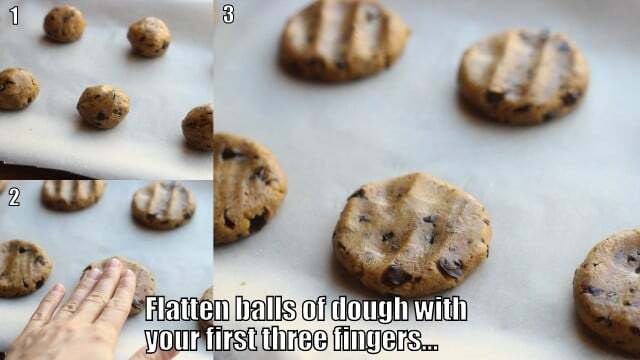 Roll the dough into eight balls and place them onto a parchment paper-lined baking sheet. After removing the baking sheet from the oven, press down on the top of each cookie lightly with a fork to flatten them a bit. 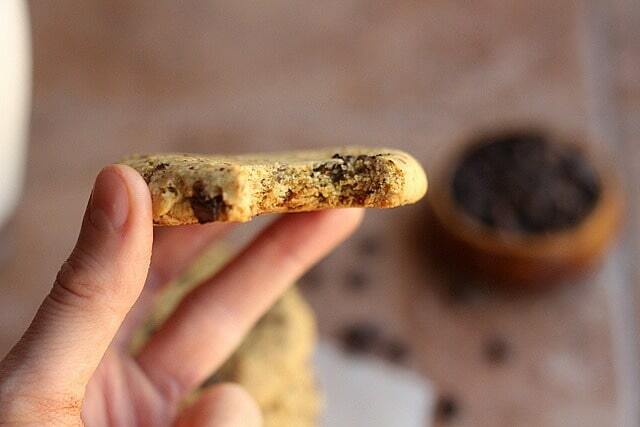 This is compacts the cookie, giving it a chewy center and crisp edges. Be sure to bake these through, OTHERWISE, you will have a chickpea flour ‘taste’. I’ve also had success with grapeseed and olive oil in place of the coconut. My husband thought these tasted like a ‘healthy Chips Ahoy’. Though I never ate enough of the name brand to make the same comparison, I have to agree that these may be my favorite chocolate chip cookie recipe….ever. 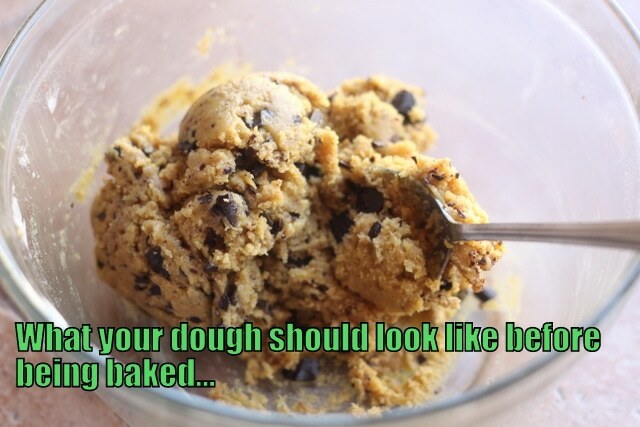 A word of caution when making the dough….DON’T eat it! 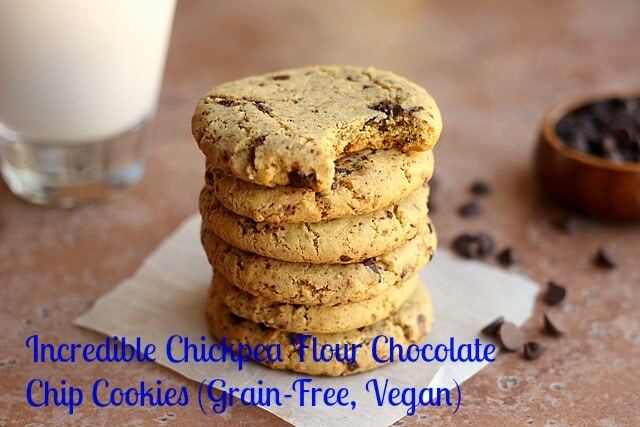 Chickpea flour tastes horrible raw, so don’t judge these until after baking. I enjoy these either fresh out of the oven or fresh out of the fridge (not sure that’s fresh, but whatev). These have an almost shortbread-like quality, in that they’re buttery without the butter. Yum! 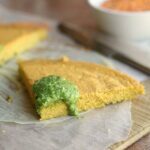 Do you bake with chickpea flour? What important trait do you look for in a mate? Update: There’s a video for this recipe showing you exactly how to make these delicious treats! I baked them for 10 minutes , I added 1 tsp almond extract and 1/2 cup sliced almonds. Next time I will flattened them , the ones that were thinner were better the way I like it crispy . Some were bigger meaning higher were more cacky. Either way they were awsome the almond extract gave a lot of flavor. Easy quick recipe the sweetness were perfect for , I don’t like too sweet . Just made these for my kids (ages 11 and 14) and we all LOVE them! I am constantly cooking and trying out new recipes so getting a thumbs up from them is a big deal. I just ordered a 4lb bag of chickpea flour so I can make a huge batch to keep in the freezer. I do have to ask what the 1/8 t. stevia powder really does. I used a small amount from one of the sweetner packets used for coffees and figured I can skip it next time. Thank you! I’m so glad you all liked them, Heidi! The stevia adds a bit more (carb-free) sweetness. I can’t believe tha amazing taste of this, I didn’t think they would be so delicious. Thank you! I’m so happy you liked them! 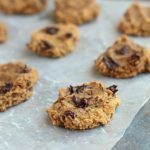 I have been making cookies and sweet breads with Chickpea flour for a few years now and your Chocolate Chip Cookie recipe is the best cookie recipe I have tried yet! Thanks so much! Aw, thanks so much, Tara! I’ve not tried it, sorry! These are the best cookies I have ever eaten and I have no allergies at all and bake healthy goods only because I love experimenting! I used only 40 grams of honey instead of the other sweeteners and find them perfectly sweet enough. Thank you so much for the recipe, I will never again need any other recipe for classic chocolate chip cookies!!! Thanks Anna, what a great comment. I’m so happy you enjoyed them! You are a genius, Lauren! I am a 14 year old baker that has 5 very hungry brothers. And these were amazing!!!! I used a chickpea and fava bean flour mix and they were fantastic!!!!!!!!! I could sing praises of these! They were very crispy once I stuck them in the fridge for a few minutes, with a consistency of a egg-filled, gluten cookie! Thanks sooo much! Hi, I just wanted to say that I’ve tried other gluten free chocolate chip recipes from the internet, which include detoxinista’s, chocolate covered Katie’s, minimalist baker’s, and most recently, meaningful eats – which was just subpar. 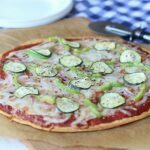 I tried this recipe today, and my family loved it. Thank you for sharing! I wound up eating 7/8 cookies, to which my lunch appetite was ruined. It’s ok though, because these were fantastic. Thanks for your thoughts Lauren. Here’s the adaptation and now favorited version of your great recipe below omitting maple syrup too. Btw, today I experimented with the 1 cup chickpea flour with 3/4 c buckwheat (needed a little extra to get same consistency) WORKED FANTASTIC. Still have the shortbread-like yummy cookie. 1/2 c. chopped dark chocolate or chocolate chips OR 1 c chopped walnuts, 3/4 c cranberries or raisins, or try CACAO NIBS! I just bought some more chickpea flour and put it in the freezer. I am wondering how long I should wait before making the cookies. Is an hour or two long enough for it to chill? Sorry for the delay, I would leave it in for 3-4 hours. I got impatient. I waited about two hours and they turned out great! This is such an awesome recipe! Thanks. That’s great, thanks for letting me know! Actually, I have used room temp chickpea flour and they still turn out yummy and well shaped too. Q: I am about to make another batch but only have one cup chickpea flour left. Do you think I can successfully substitute with a combo of buckwheat and oatmeal flours? Glad room temp flour worked for you Linda! I’m not certain about the flours, as I haven’t tried, but oat flour would be my guess as to what would work best! The recipe ended up making about 12 cookies for me. I really liked how I only needed to use one bowl. Just tried this recipe! Love it!! Probably the easiest cookie recipe I’ve tried! Thanks Angela, so glad you liked them! Lauren just wanted to let you know you can cut the calorie count down on your cookies by substituting unsweetened apple sauce in place of the coconut oil. 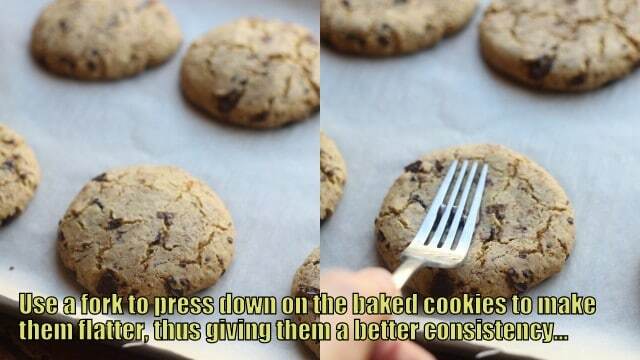 It cuts the cookie down between 90 to 100 calories. This is an amazing recipe! 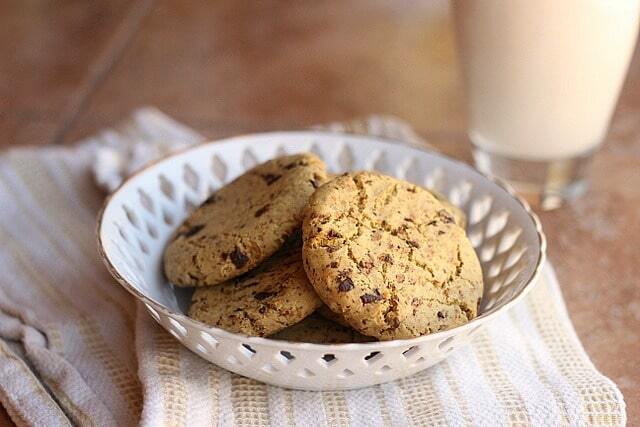 I never thought of using chickpea flour in cookies because of their sweetness. Instead of chocolate chips, though, I put raisins and some cinnamon do they tasted like oatmeal raisin cookies. Thank you so much for sharing this recipe, I have never had a better gf cookie. Thank you so much, your variations sound delicious! Ooh I use this recipe all the time! I just added some cream of tartar and cinnamon (instead of chocolate chips) and it turns out this recipe is a pretty great base for a snickerdoole! Hi Lauren, I just baked up these cookies, and they came out great! Buttery taste, chewy inside and crispy outside. My first time baking with chickpea flour was a success. What is the best way to store them? In the fridge or on the counter? I don’t want them to lose their texture. So glad you enjoyed them! I just store them in the fridge, not sure if that’s ‘best’ for texture though. Thanks for trying them! I left them on the counter stacked between waxed paper in an airtight container, and they did fine, not quite as crispy along the edges, but still yummy. I subbed brown sugar for the white and omitted the stevia, and they are plenty sweet enough. So how many batches did you have to make to know to freeze the chickpea flour and flatten the cookies when they come out of the oven?? Haha, I figured it out faster than you might think, thankfully! I love these cookies and I make them all the time! Amazing! But I have always omitted the stevia (I didn’t have any at the time), and it’s perfect without it and with no additional substitution for it! Just FYI;) Even those in my family on standard diets eat them up. Awesome Annemarie, and thanks for the tip about the stevia, that’s good to know! Thank you for your sweet words, I’m so happy you like the cookies! I’m not sure about the brownies, but if I figure something out, I’ll post it! Oh yum! I wish I had some of these to snack on right now! Thanks so much for sharing it at Savoring Saturdays linky party! Hope you’ll join us again. These sound delicious, Lauren! Thank you for sharing them at Savoring Saturdays, I’m going to feature them at this weekend’s party. 🙂 Hope to see you there! I can’t believe I’ve never tried baking cookies with chickpea flour before! These look amazing – can’t wait to try your recipe! Haha, thanks so much Kristin, glad you enjoyed them! Sounds like my childhood. My BFF was/is my dad. We have so much more in common than my mom and I do. Also, you’re killing me with your sweet treats. I know they’re healthy but gah!!! 🙂 These look awesome. Thanks for sharing!! Thank you, I’m so happy you liked them! I just made these with bob’s red mill garbanzo bean flour and they look beautiful!! Sadly they have a very bitter taste. The smell of the chickpea flour is what they taste like. Did I do something wrong? Hi Julie! I’m sorry you didn’t like the taste. What I’m suspecting is that they weren’t baked long enough?… Chickpea flour needs to be cooked through, otherwise, that ‘bean-y’ taste can really linger. I just baked these …they are so good , I used 3 table spoons molasses to replace maple syrup and didn’t use any of the other sugar . I am looking more for a healthy treat than cookies..just the best I also added a handful of toasted walnuts and refrigerate my cookies on the baking sheet for 20 minutes because my flour wasn’t cold ….thank you for an amazing recipe..
Lovely recipe! I can’t have oil though …Do you think these would work if i replaced the oil with pumpkin? Just made some chickpea flour chocolate chip cookies using your recipe. O.M.G.!! I have tried other gluten free flours before and found them lacking…too dry, weird aftertaste, etc. These cookies are so delicious and taste like a choc chip cookie using traditional flour, eggs, milk…all the things my body no longer lets me eat without consequences. I gave my husband and kids one and said they were “regular” choc chip cookies, and they all gave rave reviews. Score! I am looking forward to trying out more of your recipes. Keep up the great work Lauren! Thanks Kerry, so happy you all enjoyed them! So very excited to find chickpea flour! Your cookies were the first recipe I tried… twice 🙂 I did add 2 drops of orange essential oil the second time. Both varieties super yummy and a treat I can eat! Awesome Candace, I’m so happy you liked them! I had a baby three months ago and I’ve had this crazy sugar craving ever since. I’m trying not to eat sweets but I decided to cave by making this healthier treat. I made these yesterday and they are delicious! I used coconut sugar and since didn’t have Stevia I just used a little more coconut sugar. Like a teaspoon. Wow!!! I made these tonight and they are brilliant! Tasty..crunchy..perfect! I will be making these again and again. Thanks so much for sharing..your a nourishing food angel! 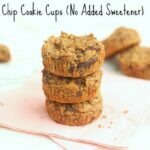 I made these today without the chocolate chips and they were delicious! My daughter and I ate them all in one sitting! I think I may add peanut butter to my next batch to see how that turns out. Thank you for this wonderful recipe! That’s awesome Heather, thanks for the comment! can’t wait to try thIs! Anything I can use instead of sugar? I haven’t tried these any other way, sorry! You could try using bananas, really really ripe ones. They are very sweet and a good binder. Just made these think I added to much water as were very very sticky ,did not use the stevia so doubled on the sugar .They did spread a lot looked nothing like yours (is that because they were to wet)They do taste very good ,have just hidden them in the cupboard so that they last until this evening!!!! Any substitutions can mess up a recipe, so I can’t tell you exactly what went wrong, but it sounds like your flour wasn’t chilled enough or you had too many wet ingredients. Best cookies I have ever made, Yummy !! Oh and my oven only actually goes up to 250 degrees so I am guessing bake for a little longer? You would be happy to know tbat besan flour (chickpea) tastes great cooked and roasted. My husband’s family are Indian and they cook with it ALL of the time. My first time cooking with your recipe today – baked goods are my one weakness so anything that can make that a healthier option is great! The real test will be my 1 and 4 year olds…. I made these cookies last night and they didn’t come out very good. Ugh I really wanted them to. I had so much hope. They still had the chickpea flour taste even after they were cooked. Is that how yours tasted? It sounds like they weren’t baked long enough, as that is what will rid the cookie of the ‘beany’ taste. I had the same problem, unfortunately. Fairly intense chickpea flavor and an almost bitter aftertaste. I’m hesitant to bake them much longer, though, since both color and texture were absolutely perfect. If anything, the cookies were darker than in your photos. Do you think turning the oven down and baking them longer might help? Yummy! Will definitively do again 🙂 Thank you so much for sharing! I’m looking for recipes to use up the huge stash of chickpea flour in my pantry, thanks to an accidental Subscribe & Save delivery. 🙂 Pinning this recipe now–it’s going on my “use up the chickpea flour” list. Thanks! Hi, I found your blog by accident when I was looking for ways of getting rid of chickpea flour from my cupboard. I am not vegan, nor vegetarian, I am no a ‘health freak’ either …but, probably because of, it I decided to give it a go. The recipe sounded odd and very different from what I usually bake. And the result is…FANTASTIC! The cookies are very, very good, so good that I am already planning to make a bigger batch for my friends. First time using chickpea flour. I used honey instead of mapel syrop. They are very good!!! Next time i will use less sugar or honey, they were abit too sweet for my taste but its definatly going to be a next time! Thank you very much for the recepe!!! Honey will definitely bump up the sweetness factor, but I’m happy you still enjoyed them! I’ve already made 3 batches of these because they don’t last long in my house. They are so delicious and easy to make! Thanks for sharing. You are a genius. Just made these and there are so good! I didn’t have the chocolate chips so I used dried cranberries instead. I need to order chickpea flour in bulk! Just made these with carob chips, they were fabulous!!! I’m vegan, my oldest son is GF and has a chocolate allergy, DIL is GF, other son is trying to eat healthier after gallbladder removal. We all loved them! My oldest grandson guessed that they were made from chickpea flour but still loved them. Going to try the black bean fudge next. So happy to find vegan sweet recipes that don’t use nuts. Thanks for the great recipes! That’s great Christine, I’m so happy you all enjoyed them! I just made a batch of these and they tasted really nice, the only thing that didnt’t turn out as planned was the texture. The ‘cookies’ were more like pancakes, quite soft, not even the edges turned crispy… Any ideas why? Still I really enjoyed them:) Thank you so much for all the wonderful recipes! Hi Lauren, I made these cookies and they were AMAZING! Thank you for sharing 🙂 I do have a question that you will probably think is really odd/stupid where did you get the measuring spoons you use? I have been looking for ones that are stainless steel and have the smaller measuring spoons as well and I cannot find any anywhere! Thanks for all of the great recipes! Hi there I just made and devoured these. My 8 year old loved them also. I used olive oil as I had run out of coconut oil but they still tasted great. 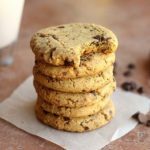 Finally, a Gluten Free, Dairy Free, Refined Sugar Free chocolate chip cookie recipe that is crunchy!!! My 13 year old daughter, who has food allergies, has been longing for a crunchy choc chip recipe, unlike most others, which are soft. These were great and got the big thumbs up from her! Thank you, Lauren, for creating this!!! Lovely recipe you have here. People should take note that if they use chocolate chips, it will no longer be dairy free, most likely. I tried these today with a few alterations, mainly honey and molasses replacing the maple syrup for a more traditional taste. And I had them extra sticky from too much water, but that was ok, because they spread nicely and were thin just how I like them. Chickpea flour is one of the things I’ve always had issues with thinking of how to use it, as it lasts longer than all the other flours and starches in use. Glad to know I can make tasty cookies now. Thank you. 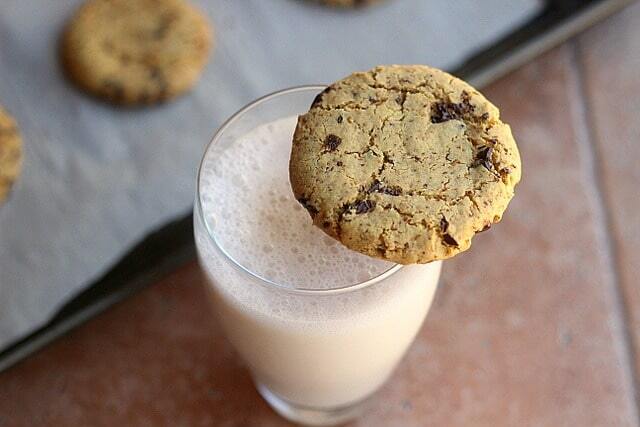 There are many dairy-free chocolate chips available. Made these cookies last night for my daughter she is a vegan and has a gluten sensitivity, they were awesome!!! thanks for sharing the recipe!!! That’s great Chris, I’m so happy you enjoyed them! Why does the chickpea flour have to be cold? This recipe uses chickpea flour as opposed to the actual bean, but Bob’s Red Mill does make a white bean flour you might be interested in! Lauren,I made these cookies today and they are delicious! I never would have known there was chick pea flour in the recipe. We are grain free and I have tried many cookie recipes with various nut flours…they are pretty good, but the texture is never quite right. These are perfect and the combination of sweeteners is just right. An added bonus…such an easy recipe! Thank you for sharing all of your hard work! i’ve never cooked with chick pea flour before, definitely something i need to try. thanks lauren for the idea! Thanks Thalia! You really should give these a try, they’re amazing! 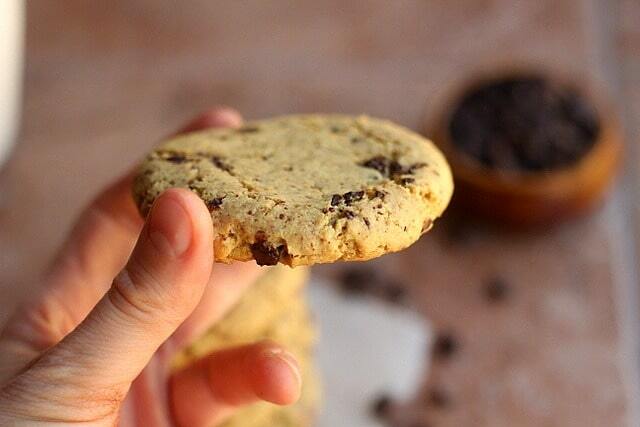 I have never baked with chickpea flour before but now I want to…these cookies look incredible! I made these the night I saw them on your blog!! I had all of the ingredients on hand. I made them without the stevia and I loved them. The batch size was perfect. Just enough for my husband and I to have a cookie a day for four days. Thank you! Whenever bloggers leave comments on my blog I immediately go look at their blog! So today, when I saw your comment I rushed right over to Oatmeal with a Fork. The funny thing is when I started reading your about page I realized I had read it before! I read it again because you have an amazing/inspiring story! I think I was led to your blog before via foodgawker. I have to admit that I probably got what I wanted then split without a comment. I’m a creeper like that sometimes. Love that you have three different food processors (I do too, and I’m considering another!)! Love that your husband is a firefighter! Mine fought wildfire for ~10 yrs. Before I go I want you to know that I’ll be back to your blog soon. I really just started blogging about healthy food consistently in May. Lastly, your Cheesy Cauliflower Breadsticks (OMG)!!! And these cookies, “PINNED”! OK, Bye! Just made these cookies – they are incredible!! Many thanks for the recipe.. all your recipes. I’m very appreciative. Be well. These look great! I use chickpea flour in baked goods quite often in combination with other flours, but have never used it on its own in anything sweet. Will have to give these a try! One of my favorite things about your blog is that your recipes usually make smaller amounts. I like 8 cookies because I don’t have tons of leftovers to store or eat really fast! So far everything I have made from your blog is wonderful so I am looking forward to making these too! Thanks! Haha, that’s so ironic Diana! My husband was just telling me I need to start making bigger batches because everything I make goes so fast! I’ve never used chickpea flour before, but now I think I’ll have to! 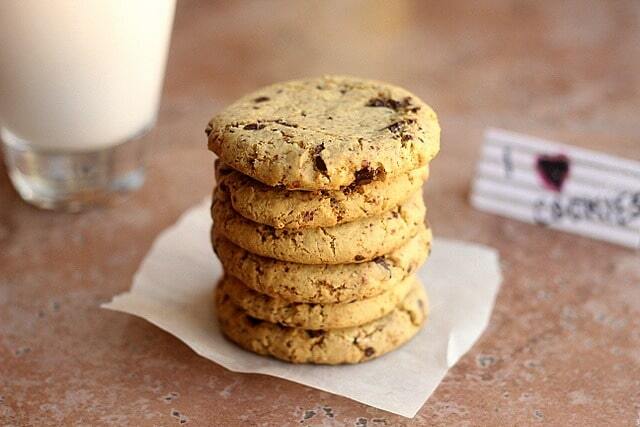 I love the look of these cookies…and they do look like Chips Ahoy! Love chickpea flour! I keep mine in the freezer too! I tried 2 batches of chickpea choc chip cookies and both batches were too salty.